She, like many women, including yours truly, and maybe even you, have been betrayed by other women, backstabbed, walked over, used, lied to, rejected, befriended and then tossed aside, manipulated and the list goes on for way too long. And while you have likely also had experiences on the other end of the spectrum –sisterhood, unconditional love, kindness, support – the wounds you’ve received from other women are always lying just under the surface, like a scab that never quite heals over. I think we all have a very personal sisterhood story about women and our female relationships. I haven’t met a woman yet without at least one “sisterhood wound” that has impacted her trust of other women. Some of us trust too easily and let the wrong women in too close and get hurt. Others have little to no trust and so let in a few to none or keep old friends around mistaking years known for intimacy and trust – and so miss out on true sisterhood. Some surround themselves with lots of women friends but never let any into her inner heart sanctum, so on the outside she looks happy but on the inside she feels alone. Some women even espouse sisterhood and unconditional love, but behind the scenes, they attack, manipulate, lie or backstab. From the age of 15 to 30, I didn’t like women much. Other than three or so women I had known forever, I surrounded myself with men. They were easier. I knew their game. We could hang out, no drama, no competition, no backstabbing gossip. But at the age of 30, after a broken engagement and a realization that the men I thought had my back, had been hiding the fact that my fiancé was cheating on me, I found myself sitting in the middle of something I hadn’t even known was missing. I’ve learned a few essentials when it comes to trusting women, that I now share with you so that you may strengthen your sisterhood bonds and gain the wisdom and strength to set healthy boundaries with the women you work with, live with, are in community with, and are in relationship with. You are not meant to be deeply connected soul sisters with everyone. Not everyone gets access into your inner heart sanctum. Just like a bank has levels of access to get the inner vaults, you too have levels of access to your inner heart sanctum. Some women are more like playmates or collaborators vs. soul sisters. Have a good time with them, explore your common interests, enjoy each other, create cool stuff together but don’t mistake connection around common interests for access to the inner heart sanctum. #3. Access to your inner heart sanctum, and deeper levels of trust have to be shown and felt. Here are my parameters for gaining access to my inner heart sanctum. • Offer respect. Both inside your relationship and in how she speaks of and holds you in her relationships with others. • Own her stuff. She doesn’t project her stuff onto you and if she does, and you bring it to her attention, she owns it. • See you fully in both your strength and weakness, without competing with or judging you. Even if she does get jealous, or your expression causes her to doubt herself, she can admit it, and doing so brings you closer. You inspire each other. • Accept all parts of you. She unconditionally loves you, even if some parts of you drive her a little crazy. • Lean in, even when it’s hard. When you come to her with a problem or something that isn’t working, she leans in, listens, doesn’t blame or need to find fault. She co-creates a solution that deepens your sisterhood. 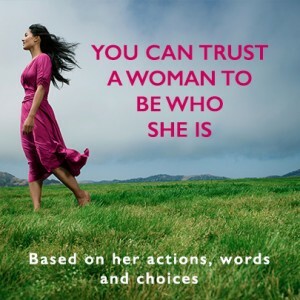 You can always trust women to be who they are. AND you can always trust your Inner Wisdom to be your discernment filter. Error: Error validating access token: Session has expired on Friday, 19-Apr-19 12:24:14 PDT. The current time is Thursday, 25-Apr-19 10:45:21 PDT.